I'll be honest I didn't try very hard to breastfeed Noah. My preeclampsia/blood pressure was still very high after delivery that I focused more on getting me under control than breastfeeding Noah. There was a point where he was going to be discharged and I wasn't and the times I tried to pump I just got so discouraged. I wish I would have tried harder but at the time I was just more worried about our health (my blood pressure and his jaundice) that it seemed not that important. Shame I know! While I was pregnant for Liam I always said I would try much harder this time around. Well since Liam came 3 months early and being a preemie I needed to try as hard as I could for him. I'm happy I've been doing it for a month already, woohoo! This picture just cracks me up. There was a time where I spilled some milk (thankfully not 6 ounces!) and I was so upset and I felt terrible the rest of the day. Oh the horror! 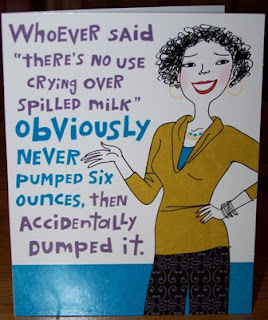 I've found pumping to be very challenging. At first it seemed easier but now it's getting tough. I don't feel like I have that much of a supply even though it's more than Liam needs but he is only getting 4 ounces a day. If he was a full term baby I'm sure I wouldn't be able to keep up. I'm glad for now that I am keeping up with his needs and it's pretty awesome he is able to get my milk, I feel that this is one way that I am really caring for him since he is in the NICU. Pumping every 2-3 hours can be a pain though especially when you have to wake up during the night to pump and not waking up to a crying baby. I honestly have to plan my day around pumping and it's getting old at just one month. My goal is to at least keep on pumping while Liam is in the NICU and then my next goal is to continue to pump until he is a year old. I hope I can keep it up because it's great for Liam! I saw that on pinterest the other day and I, literally, laughed out loud! I accidently knocked over a freshly pumped 4oz... it caused a mini melt down bc I worked so hard and long for those 4oz and now its gone! Gone! I was devestated! Some people say pumping gets easier... it never did for me (either time) but I'll say a prayer that it does for you!